A 3d pritner that can print well-formed circular parts by replacing the Z axis with a rotational one. We saw a CNC machine that could draw on eggs, and thought the concept could be applied to 3d printers to solve common problems such as the "Christmas tree" problem and cheap printers' inability to print circles. We used 80x20 to make the frame, reusing part of a printrbot frame. We then attached stepper motors, and controlled them using a RaspberryPi and Adafruit stepper controllers. The steppers from the printr bot were pretty poor. 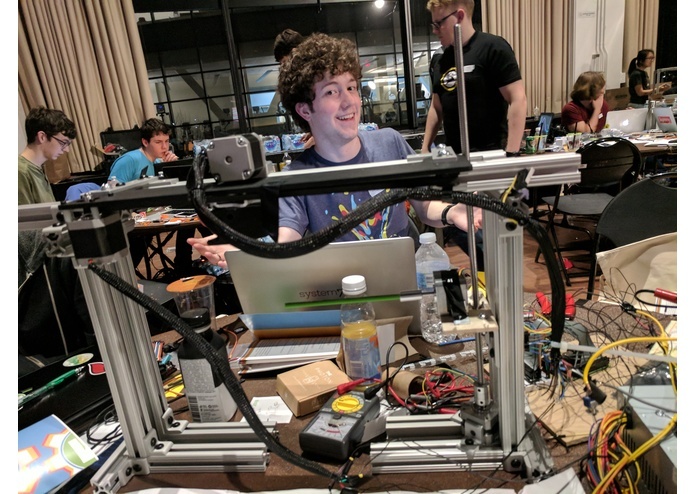 We made a 3d printer that doesn't exist on reprap, controlled by our own program, within a day! Printrbot steppers are hard to use! We want to make a gcode interpreter, make it run more smoothly.